The malevolent nightshades are a mysterious form of necrotic abominations composed of equal parts darkness and absolute evil. They are living wells of hatred and death, their mere presence sapping the light, heat, and life from all around them, leaving nothing but the heavy, hanging pallor of an open grave in their passing. Nightshades call to themselves legions of lesser undead and shadow-spirits — those who hate the burning sun and the sweet spark of life as much as they themselves do. They rarely ally with living beings who share their vision of extinguishing the sun and exterminating all who stand before them, though such alliances do, at times, occur. Adapting the forms of their kind to pursue the cause of death in every environment and situation, upon the land, in the sky and the sea, and even in the deep places of the world beneath, nightshades marshal their unliving armies. Yet for all their singleness of purpose, they are no mindless beasts. They're clever and patient planners, willing to grant favors to allies or minions as long as they prove themselves useful, and equally willing to turn on them and destroy them the moment their usefulness has been exhausted, rendering their tortured and murdered spirits into new undead slaves. Unlike most other undead, the nightshades aren't "just" the reanimated corpse of some dead lifeform, but rather a more "pure" expression of necrotic power. They don't even come from the mortal world, being natives to the dimension of Mabar, the homewold of undeath and darkness, the origin-source of negative energy itself. Many see them as "avatars" of that plane, similar to Angels and other Outsiders, embodying the very concepts and identity Mabar itself. 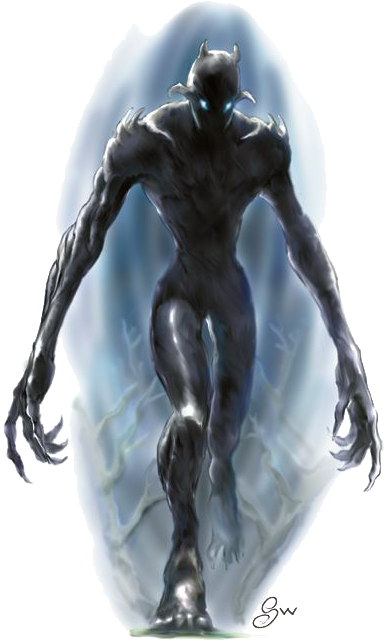 The most common nightshades are the nightwalkers, long-striding giant fiends often found at the head of undead armies. They are the generals of the nightshade army, the commanders of legions and the organizers of the deaths of worlds. Yet in places the nightwalkers can't easily reach, the vast gulfs of the sea and the soaring heights of the clouds above, other nightshades rule. Above flop the immense bat-like nightwings, deadly in their own right yet content to serve at the behest of their stronger cousins. When these monstrosities come to the mortal world, they swoop down in the dawn to take shelter in abandoned necropolises or vast crypts, emerging at dusk to prey upon nations. As above, so do the realms below quake from the passage of nightshades. Here, immense nightcrawlers slither and creep. These umbral worms do not often venture forth from the deep, forgotten caverns they dwell in, but when they do, entire kingdoms die as their nighted coils writhe and work their inevitable way through the population. 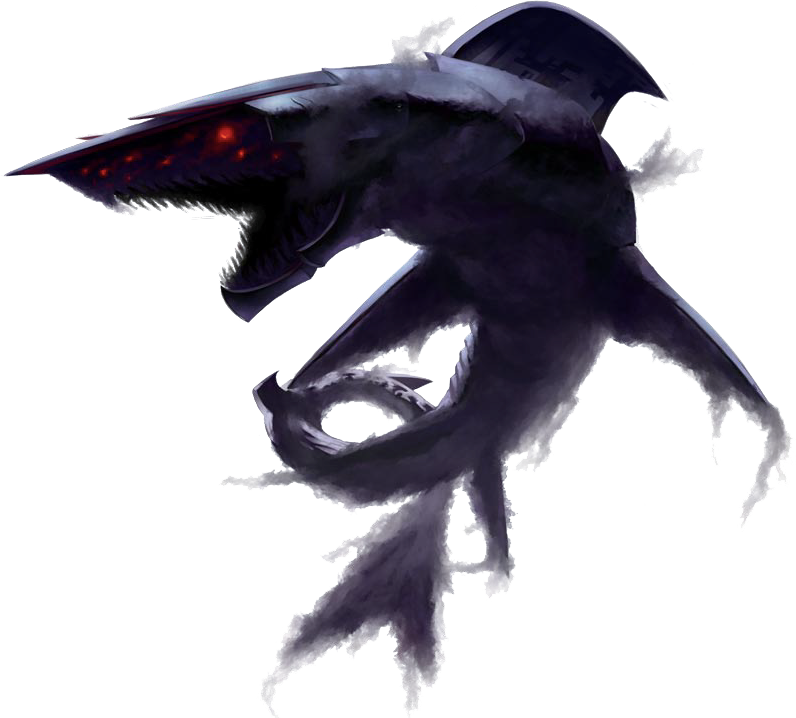 But for all of the nightmare potential posed by these undead paragons, they all pale in comparison to the mightiest nightshades of all — the shark-like nightwave. This monstrosity prowls the lightless depths of ocean trenches, gathering the corpses of the countless drowned dead or preying upon deep aquatic races. Yet those who cleave to the shallows or ply the surface of the seas aren't safe from the ravenous nightwaves either, for in the darkest night, these undead monsters rise up to harvest bodies from ships and shore as well. Yet even the dreaded nightwaves aren't enough to fill the nightmares of great heroes. Rumors of more powerful nightshades are whispered fearfully in certain circles — creatures of such immense power that their mere existence can drain entire planets of life in a matter of weeks. If such monstrosities truly exist, then all life may be but a fleeting spark in the dark folds of a forever-doomed future. Languages: Their native language is Mabran, but they usually prefer to communicate through their innate telepathy. Darksense (Ex): ●Gain "true seeing" in dim light & darkness. ●Regardless of light conditions, they can detect living creatures and their health within 60 feet, as Blindsense with "deathwatch" continuously active. ●"Mind blank" and "nondetection" prevent the latter effect but not the nightshade’s "true seeing". Desecrating Aura (Su): Have a 30-foot-radius emanation equivalent to a ''desecrate'' spell centered on a shrine of evil power. Undead within this radius (including the nightshade) gain a +2 profane bonus on attack & damage rolls & saving throws, as well as +2 HP per HD, and the save DC of channeled negative energy is increased by +6 (these adjustments are included for the nightshades in their entries). This aura can be negated by "dispel evil", but a nightshade can reactivate it on its turn as a Free action. Desecrating aura suppresses & is suppressed by "consecrate" or "hallow"; both effects are negated within any overlapping area of effect. Light Aversion (Ex): ●In bright light it becomes sickened. ●The penalties from this condition are doubled when the nightshade is in natural sunlight. Channel Energy (Su): ●Can channel negative energy as cleric of a lvl = its base CR. ●It can use this ability (3 +Cha mod) times per day. Summon (Sp): Can summon undead creatures. ●They can be summoned only within areas of darkness. ●Summoned undead can't create spawn. ●The exact type & number of undead they can summon is different for each type of nightshade. ●Don't breathe, eat, or sleep. & any abilites that rely on Constitution (f.ex. calculating a breath weapon’s DC). ●Can't heal damage on its own if it has no Int score, although it can be healed. Negative energy can heal undead creatures. The ''Fast Healing'' special quality works regardless of the creature’s Int. ●Is immediately destroyed when reduced to 0 HP. ●Not affected by ''Raise dead'' & ''Reincarnate'' effects. turning them back into the living beings they were before being undead.